“Everybody talks about the weather, but nobody does anything about it,” Mark Twain once said. Is the same true for declining cinema youth attendance? Not in France, which is making sure that the next generation values and keeps the ‘7th Art’ alive in cinemas. To overcome this drop and respond quickly to the first problem, exhibitors have at the beginning of the year set a single price of 4 euros for children under the age of 14. The operation caused some gnashing of teeth from the distributors, who have seen their revenues decline. It nevertheless proved a success, and contributes greatly to the revival of attendance in the last six months. More fundamentally, the education aspect of cinema is subject to multiple touches. A report commissioned by the CNC has been finalized. Directed by Xavier Lardoux, Deputy Director General of Unifrance (Support Association of French cinema export), he advocates through 10 measures, the establishment of a genuine European policy for film education. Calling the theatrical platform ‘the largest pay-per-view platform in the world’, Cinemark’s CEO Tim Warner calls for big shows like HBO’s “Game of Thrones” and episodes of “The Voice” to be shown in cinemas. Give the success of TV events like “Dr Who: The Day of the Doctors” even in the US, it would be more surprising if he didn’t call for cinemas to have access to such premium content. If nothing else, it gives credence to Quentin Tarantino’s recent rant that “Digital projection, that’s just television in public.” And “Game of Thrones” did screen in one particular cinema. USA (NY) – Following yesterday’s story about how AMC is re-seatings its auditoriums – which I hope you’ve all read – here is a similar effort underway by National Amusements, which has gone so far as to shrinking from 3,000 regular seats to less than 1,000 across 12 theatres. A night at the movies just got a bit cushier. 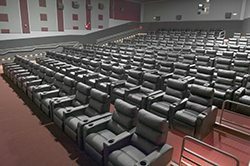 National Amusements has just completed the next step in its multi-year Broadway Multiplex Cinemas renovation project, which includes seat upgrades in each of the theater’s 12 auditoriums. 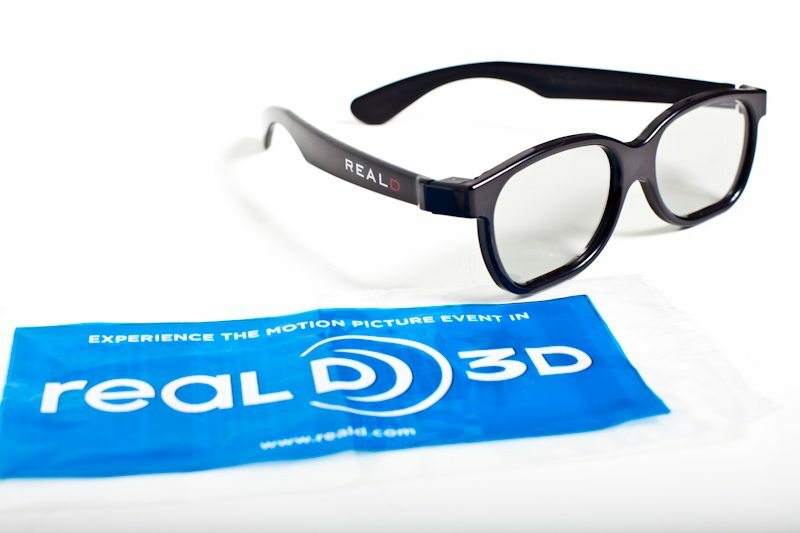 USA – RealD shares went up a bit on the back of better-than-expected results. The company said revenue was $40.6 million in its fiscal fourth quarter, down from $45.4 million a year ago. Its net loss was $5 million, up from a net loss of $4.3 million. The company said for the year it generated $13 million in cash flow, which CEO Michael Lewis attributed to a cost-reduction plan and a focus on expansion in high-growth areas of the country. India – The recent change in government in India has given investors hope that the entertainment sector will soon experience a boost with a more business friendly administration in place. Hence the renewed interest in cinema owners and mall operators. 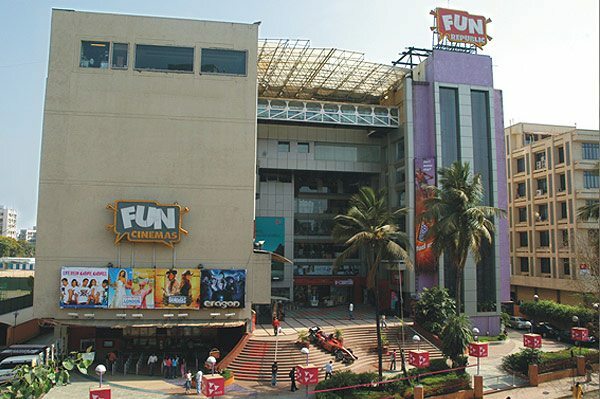 Private equity firm Everstone Capital is in talks to buy a significant minority stake in the Subhash Chandra Goel-controlled lifestyle mall operator Fun Republic as a stable and pro-growth government at the Centre rekindles hopes of greater spending on entertainment. 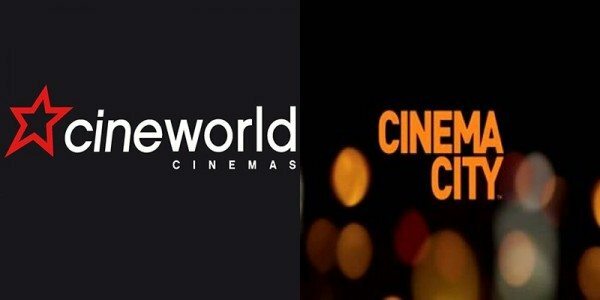 UK/Poland/Israel – A vote of confidence in the merged Cineworld-Cinema City by its senior managers. Two directors of Cineworld, the Greidinger brothers, have snapped up more than £5million worth of its shares. Moshe Greidinger, chief executive of the multiplex chain that is the UK’s biggest cinema operator, and chief operating officer Israel bought 1.6million shares at 340p a pop. 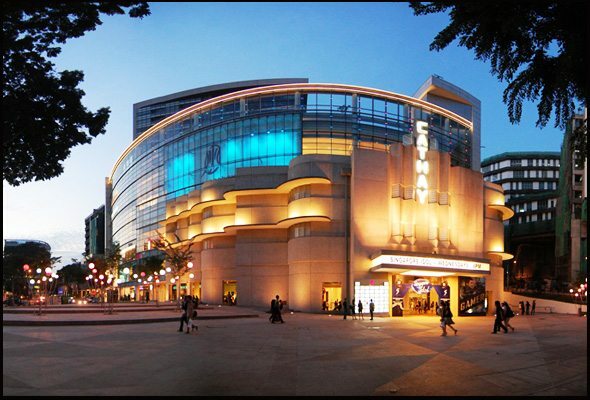 Singapore – All four of Singapore’s cinema chains have raised their ticket prices for weekend shows, in apparent unison. MOVIE-TICKET prices here have been on the rise, with a weekend screening at Cathay cinemas now costing $13. While the Cathay ticket price increase is the highest so far, all four cinema chains have upped their prices this year, Lianhe Wanbao said. Cathay tickets for a 2D movie on weekends and Friday evenings used to cost $11. Golden Village theatres now charge $12.50 on Friday evenings and weekends, up from $11.50, while weekend and Friday-evening ticket prices at Shaw theatres are up a dollar to $12. One letter writer to the Competition Commission Singapore is very upset about it. India – Advertisement has long sponsored television shows, but can it work in cinemas? I guess it helps that most Indian films have intervals, but usually that’s when people go for toilet break or to buy more concessions. Just wait a while before disbelieving such a scenario as a new Malayalam film is all set to be released with the promise that it can be watched free of cost at movie houses, at least in the initial week. A contempt petition has been moved against top officials of the Commercial Taxes and Registration Department after film exhibitors and authorities started collecting levy from the viewers of Rajinikanth’s latest film ‘Kochadaiiyaan’ despite Madras High Court direction not to do so. Hearing a petition filed by S Muthiah, the High Court bench comprising Acting chief Justice of Madras High Court Satish K Agnihotri and Justice M M Sundaresh granted one week’s time to S K Prabakar, Principal Secretary of Commercial Taxes and Registration Department and Commercial Taxes Commissioner K Rajaraman to produce an affidavit of compliance. 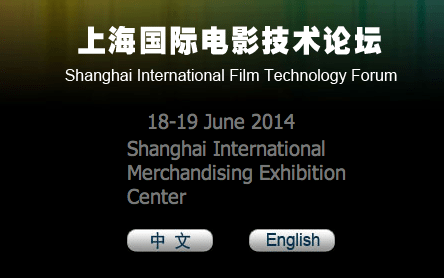 China – Running in parallel to CineEurope is not just Cannes Lions but also the Third Shanghai International Film Technology Forum. Very frustrating as I ideally need to attend all three. If we say that the Internet profitable for the theater is more of a supporting role in the promotion and then the rise of the network may be a development of cinema theater bigwigs do not want to see. Famous American director and screenwriter Paul Schrader said, we have now entered a “post theater era”, the film is entering the era of multi-platform network era from the theater, but that does not mean that the cinema will disappear in the near future, new film screenings mode broadens the film distribution channels, occupies a place in many possible pathways. But this is a long-term capacity development for the theater is not a small challenge. How to deal with a more open market environment, theater practitioners who need to sit down and chatted. In the theater of the forum, by the Fang Bin, general manager of the cinema hosted the earth, Poly Culture Group Co., Ltd. President Liu Debin, Zhujiang Film Media Co., Ltd., Zhao Jun, general manager of SMI International Cinema Ltd. Wang Lun Xi, Beijing Bona Huang Wei peak dialogue Starlight Theatre Management Managing to participate, I believe the future of theater development in China road to make the best interpretation. UK & Ireland – Not the first time a director has hosted a Q&A in conjuncture with his/her film, but interesting to see a big star using it to give a niche film and documentary a push. Al Pacino’s Salomé, based on Oscar Wilde’s play, and accompanying documentary Wilde Salomé are to get a UK release as part of an event at London’s BFI Southbank. 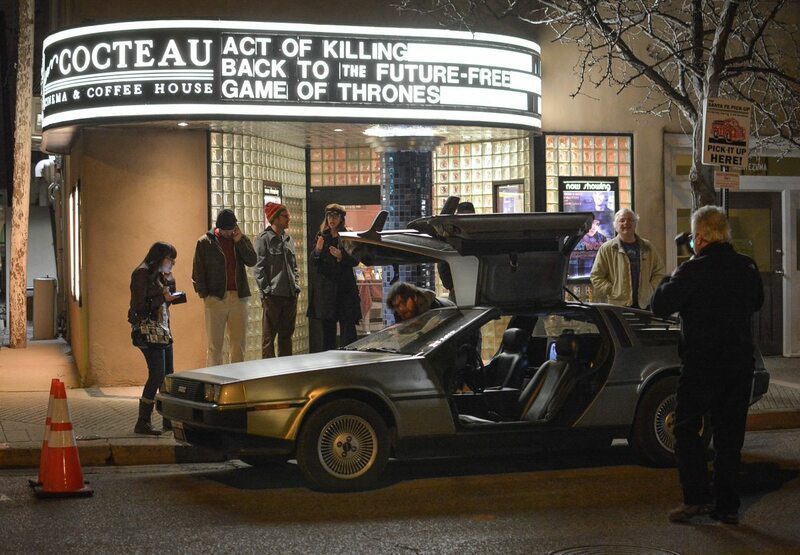 UK – Secret Cinemas’ plan to screen Back to the Future in a replica of the film’s town square has proved an astonishing success. 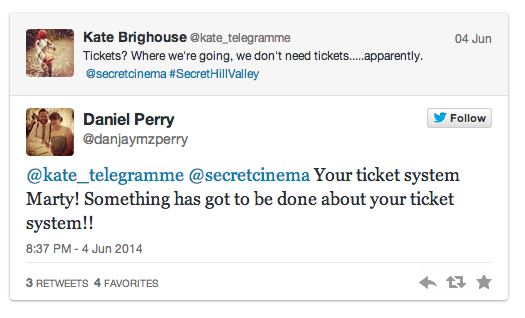 As always, Twitter was the outlet to vent despair, humour and film references for those frustrated about getting tickets. A screening of ‘Back To The Future’ has broken the world record for ticket sales, according to reports. Secret Cinema, the ‘experiential film company’ which exhibits films in elaborate locations, shifted an astonishing 42,000 tickets for their screening in just four hours. UK – This Odeon cinema claims that event cinema is what has enabled their astonishing audience growth. 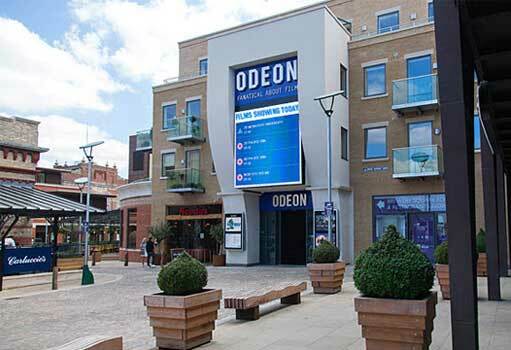 Dorchester’s Odeon cinema is claiming a 45per cent increase in audience numbers – the highest percentage growth in the group. The cinema puts the figures down to the variety of content shown on its big screen, which includes live broadcasts of National Theatre, Royal Ballet and Royal Opera House productions as well as the latest movies. Australia – So far I’ve only read about the World Cup screening in cinemas in China and Australia. Anywhere else? Anyone? With the World Cup only eight sleeps away, this is a reminder to purchase your tickets at the Southern Cross Cinema to watch the game on the big screen. Tickets are only $10 each which includes breakfast plus prizes and many give aways. You won’t get a better offer so hurry as tickets are selling fast. UK – A social media tool for cinema-on-demand. Not the first or only attempt, but interesting nonetheless. 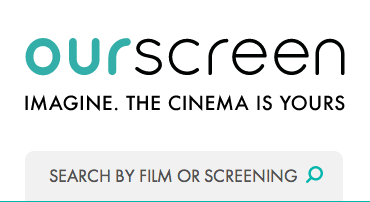 Ourscreen is a new digital and social platform that aims to empower film fans and local communities to create and attend their own screenings at their local cinemas. The project is becoming available across 13 cities including London, Norwich, Bath, Exeter and now York. Jessica’s event will become a reality in York on July 6 at 8pm, but only if enough people book tickets to attend. That number is not specified, but the more, the better. 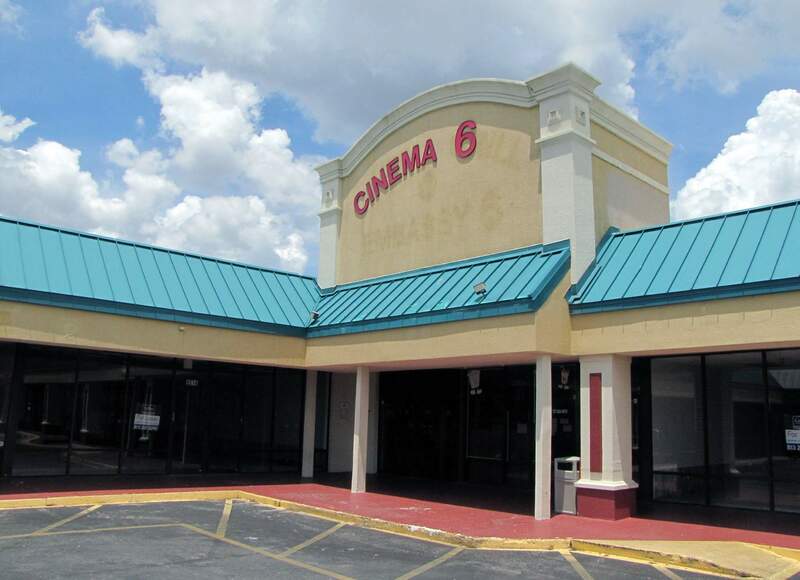 USA (FL) – The phasing out of 35mm prints meant that this second-run cinema didn’t get a copy of Disney’s Frozen until after it was out on DVD. It has launched a Kickstarter campaign to go digital and put a donations box in the lobby. But the outlook is bleak. Cinema 6 in Port Richey is struggling to convert from film projectors to digital projectors, and movie studios will stop making 35mm prints by the end of the year. Cinema 6 faces huge expenses to upgrade to digital projectors. USA (FL) – But this fellow Floridian cinema managed to stage a digital comeback. 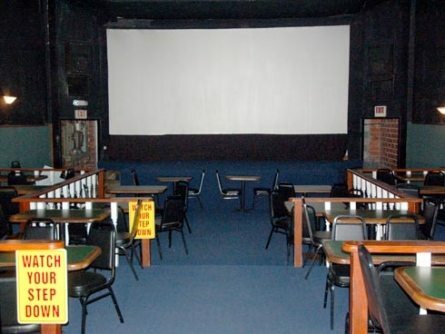 The new business opens a little more than a month after Cinema Plus, the previous business to operate out of the historic movie theater building, showed its last movie and closed its doors. “I think it’s one of those things that people didn’t know how good it was until it’s gone,” said new owner James Coleman. Since talking over the lease of the old theater building, which first opened in 1940 as the Tringas Theater, Coleman has invested more than $50,000 into the property. One interesting aspect is the USD $1 increase in the ticket price. USA (PA) – Lets hope that the next mall owner requires a movie theater as a condition of sale. The sheriff’s sale for the Mall at Steamtown has been rescheduled to July 15, but the mall’s theaters could close as early as September, according to an employee of Marquee Cinemas who requested anonymity. 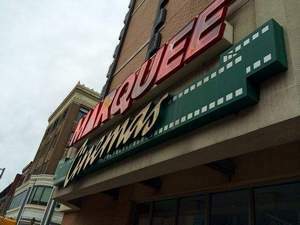 According to the Marquee employee, the theaters could cease operations when students return to school and the summer movie bonanza is over. UK – An autism-friendly screening of an autism-themed play. Very appropriate. 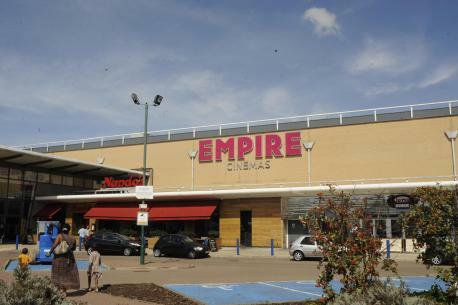 The Empire Cinema, at Festival Leisure Park, in Basildon, is showing an autism-friendly viewing of the Curious Incident of the Dog in the Night-Time. The screening welcomes people with autism, sensory or communication disorders or learning difficulties. UK – A derelict cinema in Wellington, Shropshire looks set to get a new lease of life if plans to convert it to an arts centre go through. 100-seat cinema, as well as studio and rehearsal spaces. The project is inviting members of the community to buy shares in the business to raise enough funds to purchase the properties. We end with a bit of cinema art-deco nostalgia. 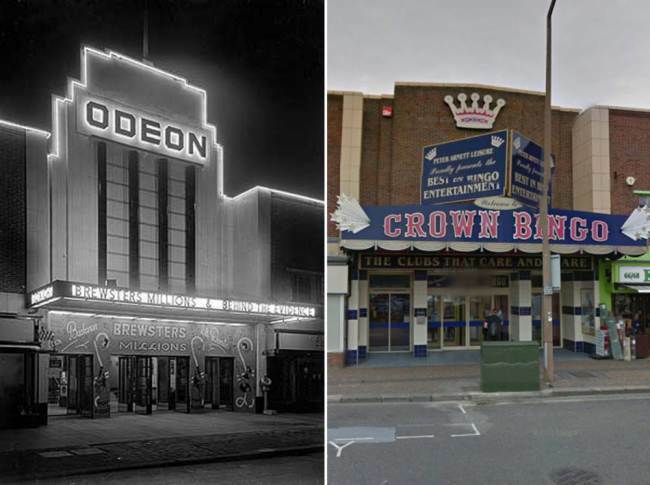 They were once icons of the 1930s, and some of them still retain their charm, but other grand Odeon cinemas have seen better days. 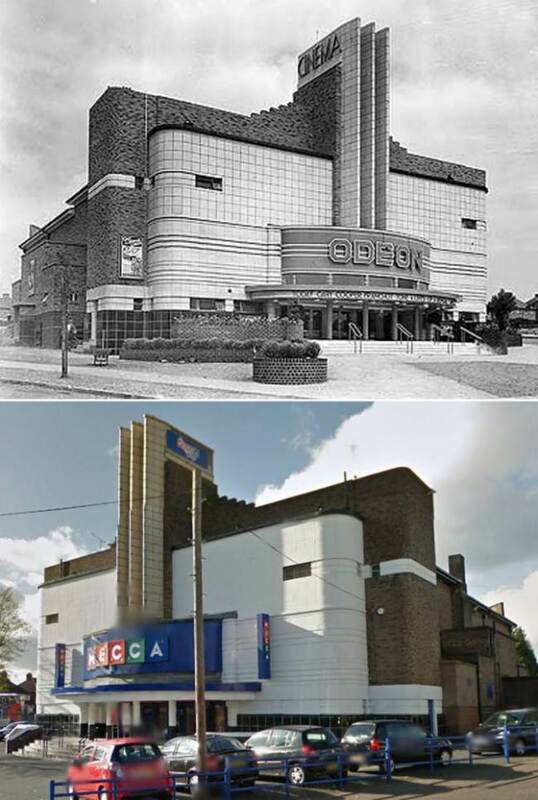 While most of us are happy with a comfy seat, a decent sized screen plus a bottomless popcorn bucket, a major draw for cinema goers visiting an Odeon 70 years ago was the chain’s unique style. The buildings boasted striking facades with neon lights and strong vertical and horizontal lines. Inside, the glittering foyers and bars featured sleek curves and murals. The design, adopted by the chain’s founder Oscar Deutsch, was a departure from the traditional theatre-look which most cinemas resembled, and by 1939 there were 136 Odeons. Three years later when Deutsch died there were 258. Become bingo halls, that’s what’s become of them!